The final development permit for a proposed waterfront hotel to rise up to 67 feet and six stories in height on the Jack London Square parcel known as F3, behind which a proposed 326-unit building is slated to rise up to eight stories on the parcel known as F2, could be approved by the city this week. 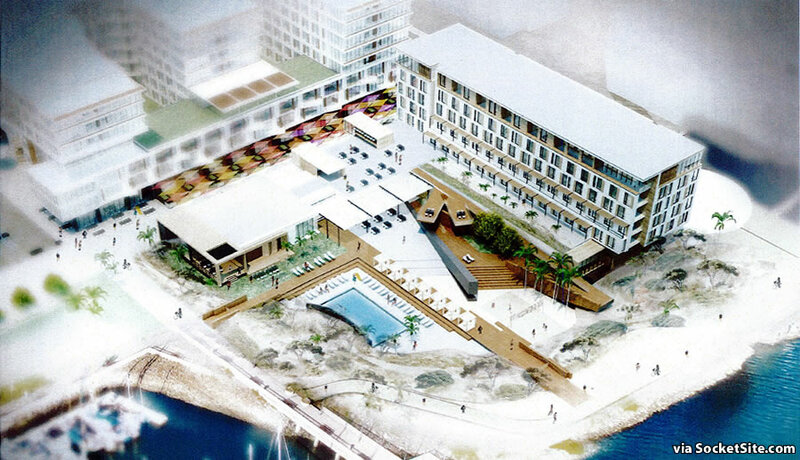 As designed by Solomon Cordwell Buenz (SCB) for the CIM Group, the proposed Jack London Square Hotel includes 155 hotel rooms with an open restaurant and bar(s), a series of resort style patios, an outdoor pool and volleyball court, and landscaped dunes overlooking the existing Bay Trail and estuary. And in order to address some Planning Department concerns and better integrate the hotel into the surrounding District as a whole, the hotel’s private meeting space has been moved and an open cafe now sits at the corner of Water and Harrison with an adjacent connection to the Bay Trail. No. Destination Waterfront Hotel slated for approval in OAKLAND. Is that so hard to say? What they said is not inaccurate. It was not an attack. Stop taking trivial nonsense personally. The victim complex is of literally zero value. Focus on the substance of the proposal. And it allows us to deny ownership: in THIS particular case I’m all for that. Anonymous, it’s not trivial when you deny a city its existence. You seem to be taking the critical comment much more personally than anyone has the use of “East Bay” in the headline. Honestly, SS probably wrote than headline to push buttons (and show indifference to Oakland), which is really immature. It absolutely is trivial. There is no conspiracy or malintent involved in this this post. You have zero evidence to indicate otherwise, and you are positioning your conjecturous opinion as fact. Period. And by the way, nobody anywhere here has denied the existence of Oakland. You’re doing a godawful job of representing Oakland and yourself in an even remotely positive light. I have disagreed with a number of posts, but not this one. Oakland is a city in renaissance, a growth and revival that is deeply moving but also not free at all from troubling American dynamics of white racial privilege, white class power, and the unfocused and often utterly counterproductive responses available to and embraced by the marginalized. Given that much of the “East Bay” consist of suburbs created for, by, and in league with the racism-driven white flight; given that through taxes and core infrastructure, marginalized Oakland of the mid-twentieth century actually paid for much of the “East Bay,” which returned the favour by red lining and siphoning state and federal resources away from Oakland to said “East Bay,” you’re quite on point: the obscuring of Oakland at this late date amounts to a denial of what it has overcome, what it is achieving, and what was done to it in the first place. “East Bay” is a SF-centric term designed to deny Oakland its own identity. Much like “The City” is an SF centric term used to show San Francisco superiority and dominance. So yes, when people refer to Oakland as “the East Bay” that’s an insult. Yet you have nothing at all to say when South San Francisco projects are referred to as being on the peninsula rather than by the city name. Or when a San Rafael project is referred to as Marin. Or when a Santa Clara project is referred to as South Bay. The only people that consider any of these an insult are those with no interest in substance. Those are all small cities which may be easier to identify using a larger geographic location. Identifying San Jose as “the South Bay” would be insulting to San Jose residents, I would assume. Oakland is a great city with 426,000 residents with its own cultural institutions, Zoo, museums, theaters, symphony, and sports teams. Referring to Oakland as if it’s some insignificant SF suburb by calling it “East Bay,” is insulting. Thanks for admitting to your own egregious hypocrisy. E. Gonsalves: South bay and east bay residents say “south bay” and “east bay” all the time, because those areas are the southern and eastern parts of the bay area. Stop being dumb. The full name is the “San Francisco Bay Area”, by the way, i hope that doesn’t upset you too much. I am a NYC citoyen, recently exiled to San Francisco. I could not agree more with you. I actually have roots in San Francisco (but I grew up largely in England). But my biracial identity owes to my immigrant Northern English father and Latina mother who met in Oakland. I know that city’s history both academically and intimately. But not San Francisco media. Let me reiterate what I stated to Occupied in Oakland: Given that much of the “East Bay” consist of suburbs created for, by, and in league with the racism-driven white flight; given that through taxes and core infrastructure, marginalized Oakland of the mid-twentieth century actually paid for much of the “East Bay,” which returned the favour by red lining and siphoning state and federal resources away from Oakland to said “East Bay,” you’re quite on point: the obscuring of Oakland at this late date amounts to a denial of what it has overcome, what it is achieving, and what was done to it in the first place. To get my NYC on, as it were, I leave my rich, ethnically cleansed, narcissistic San Francisco for Oakland: great restaurants, beautiful hillside neighborhoods, and most of all, the powerful ethos of a diverse, many hued community united in revival. Great stuff. I love your posts, by the way. They capture that Oakland grit and grace. The palm trees are a bit out of place. I wouldn’t have thought a local firm would fall into that trap. Absolutely true! Palm trees are NEVER used in signature Bay Area projects! There is zero history of using palm trees here. Heck…we should use a few manzanita shrubs and scrubby coastal bush grass to REALLY capture the flavor! this seems really, really bizarre. I hope the developers know what they’re doing! What’s bizarre about it? The design could probably use an update, but looks like a pretty basic waterfront hotel in an area that needs more hotel space. 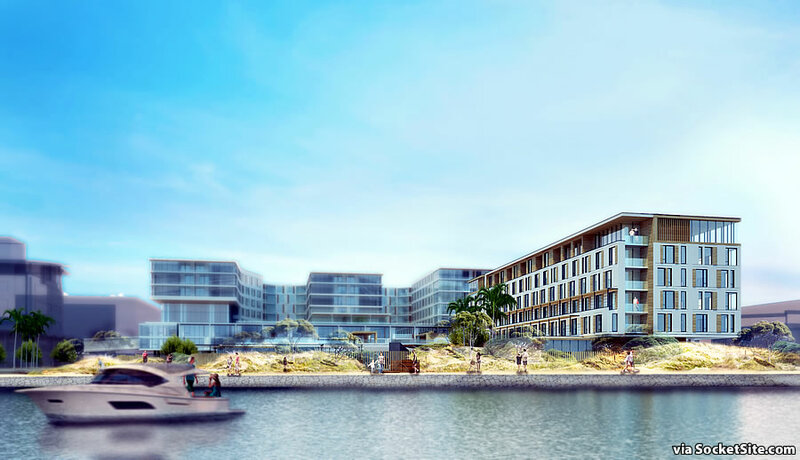 waterfront hotel with sand dunes, palm trees and a resort style pool…on the edge of a highly industrial, major working port? in a neighborhood surrounded by freeways, factories, and warehouses? this belongs in santa monica, not in this part of oakland. Nah. It’s five blocks east of anything associated with the Port of Oakland, five blocks away from Highway 880. Not really any factories anywhere on that side of Broadway in JLS, although I’ll give you the produce warehouses. And yeah, the palm trees are kitschy, but JLS already has a ton of palm trees in the square, so at least they’re keeping the theme going. It’s okay, Oakland can have touristy things too. It won’t immediately Santa-Monicafy the city. The site doesn’t feel industrial at all. It’s next to JLS, an apartment complex and the estuary. with a view of sailboats and the bay. There will be an eight story apartment building between the tracks and the hotel. Here’s the view. And excellent access to SF via ferry. The clued-in attendee of a downtown SF conference or convention would consider this a good option. Other than the silos over on Alameda Island, it’s a nice view for an Urban hotel setting. The palm trees may be cliche, but if they planted Monterey Pine they would be pretending to be on the Central Coast, or they choose a bunch of flowering bushes and trees and try to look like a Hawaii resort… I would probably have chosen the pines, keep the sand dunes and plant some succulents. London Plane Trees – which I believe is actually a nickname for some type of sycamore – were always the default planting; if they want something taller, then I would suggest a redwood, tho admittedly the proximity to the salt water may be an issue. As for having “a ton of them ” – literally it has several tons of them – that’s all from the past 10-20 years…’twas palmless before that. This is a very bucolic and scenic area. There is nothing “industrial” about Jack London Square. What’s with always trying to denigrate anything Oakland? Scenic perhaps though hardly “bucolic”. There is some nice greenery and of course all the piers and watercraft. Okay, I’ll settle for scenic. What’s wrong with “industrial”? Why are you trying to erase the great history of Oakland as a working class town with a port and factories and …. Oakland is not an industrial working class town. That’s just SF spewed nonsense. Oakland is as industrial as San Francisco. There are no factories, smokestacks, or refineries in Oakland. You do know that I-10 cuts through and ends in Santa Monica? Also Los Angeles is bisected by freeways. Is Oakland the only city in the Bay Area and California with freeways crossing the city? 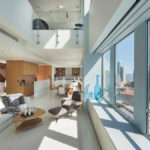 If San Francisco can have Union Square two blocks from the Tenderloin, Oakland can certainly have a destination hotel in lovely Jack London Square. There are retail vacancies all over San Francisco. Oakland is doing pretty well with Piedmont Avenue, College Avenue, Lakeshore, Grand Avenue, Temescal, etc. This hotel should help JLS. Your description of Oakland is perfect––for 1954. Oakland is not an industrial centre anymore and it hasn’t been since the mid-twentieth century. The city’s ruinous decline in the mid-twentieth century resulted largely from the deindustrialization––Caterpillar, GM, Del Monte, for example, pulled out almost overnight to relocate their factories, leaving vast segments of the flatlands in which they were located devastated. The warehouses you describe are now largely home-work spaces inhabited mainly by artists, Maker Faire producers, urban cannabis farmers, and wealthy trust fund “creatives.” The major working port is both vital and, thanks to the cleverness of Oaklandish and other waggish Oaklanders, positively iconic. I wonder, MKP: given that all-white hipster Williamsburg in Brooklyn borders a “major working port” and is a neighborhood “surrounded by freeways, factories, and warehouses,” why is it chic for Williamsburg, Brooklyn hipsters to build in their midst crazy, “Santa Monica” style structures. But for multiracial hipsters/blipsters of NYTimes’ “Brooklyn by the Bay” Oakland, such audacious juxtapositions are no longer “clever,” “quirky,” “precocious” and all of the other positive connoted things white people say about all white hipster Williamsburg. This hotel will be great for baseball fans attending A’s games at the nearby Howard Terminal. Lake Merritt and the Oakland Museum are also straight up Oak Street. Can you provide links to where the city council, coastal commission, Port of Oakland, Alameda County, A’s, etc. all agreed to and gave approval building a stadium at Howard Terminal? Not yet. The Giants got the coastal commission to approve their waterfront park, why can’t the A’s? In my view, since Peralta Colleges cannot fathom making their neighborhood prosperous and making their Lake Merritt-adjacent campus repositories of new generated wealth––a strange way of thinking for a school and student body dedicated to uplift for and upward mobility for the marginalized––Howard Terminal is the natural, perhaps the only real viable option. I love this project. It makes people think differently about Oakland. It would be nice too if this project is the impetus to FINALLY get something in the ground floor of the building to the northwest of this big pink F3 parcel. It’s been empty for at least eight years now. I don’t think the folks managing JLS really know what they’re doing. People who hold ignorant outdated stereotypes will never think differently about Oakland. The city has changed so much in the last 15 years and many of the biased and ignorant attitudes from outsiders remain the same. All they do is pretend that anything they may perceive as nice is “not really Oakland.” I’ve long stopped trying to educate the biased and ignorant. Oakland just needs to move ahead and be confident in itself as a great city. Oakland asendent has appeared on the NYTimes prestigious annual Places to Visit numerous times. The Boston Globe, UK Express, UK Telegraph, UK Independent, National Geographic, UK Guardian, Le Monde, NPR, of course that local rag, the NYTimes, again, with its absurd-but-strangely-on-point meme (Brooklyn by…oh, never mind), etc., etc. : all extolling the compelling narrative of revival, Oakland as culinary hot spot, culture club, multiracial Hipster Haight of the new century, and so on and so forth. None of this matters with, to put it frankly, the racists, not a few of them self-described “progressives” in San Francisco and thereabouts. No, to them Oakland 2018 is Oakland 1973. It must be. And that, I think, is the core of their : “Oakland” the Other of racist, classist delusions –– as opposed to Oakland sans scare quotes––must exist as it was, forever. I’ve lived in JLS for over a year now after living in SF for over 6 years. We love living in JLS and super excited to see all the changes coming along. Sure, there are vacancies and struggling businesses, but the momentum is always around the corner. Especially now with the A’s moving their corporate HQ to JLS and over 1000 apartments on the horizon (a large amount will go live this year at 4th and Jackson) and that’s not even including the nearby Brooklyn Basin project. Once the adjacent apartment building is built by this hotel, it will completely transform this area of JLS. Let’s not forget the ESports arena that will be just on the other side of the tracks and connected by the walkway. Great points. There is so much going on in and around Jack London Square. 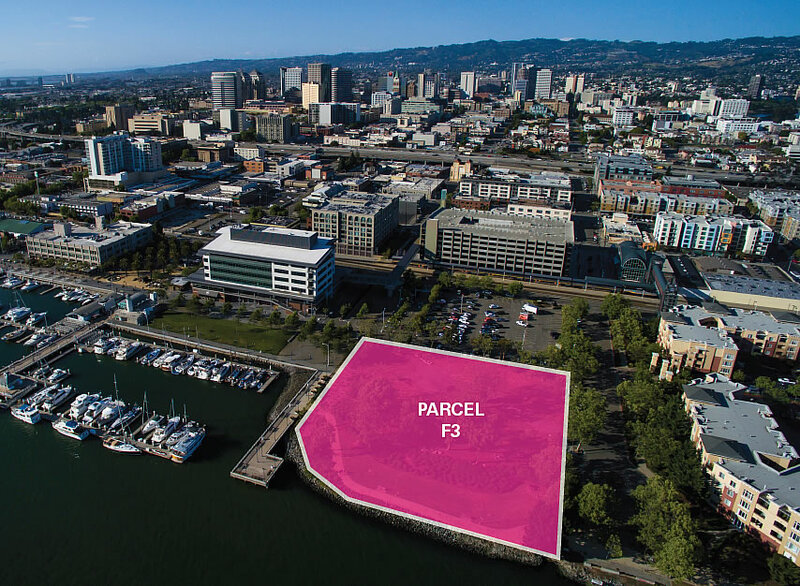 The 3100 unit Brooklyn Basin and its 30 acres of waterfront parks, along with biking and walking trails, will extend Oakland’s waterfront south from JLS. There is already quite a bit of dense housing in the JLS Warehouse District. It’s hard to understand why there isn’t more foot traffic arlready at The Square. The Oakland waterfront is going to be a jewel for out entire region once all of these projects are completed. Anonymous, the Port of Oakland and A’s are to meet on the 22nd to discuss “price and terms of tenancy” at Howard Terminal. A new A’s head office just opened at Jack London Square. Nothing is set in stone, but a picture is developing. Besides all that hotel occupancy in Oakland is a healthy +80%, so we can adsorb the new rooms. Wow! That’s awesome news. An A’s ballpark at Howard Terminal would energize JLS and Old Oakland like nothing else. CIM just broke ground on the adjacent parcel to this hotel. That’s 333 more housing units under construction in Oakland. All this new construction is really going to bring incredible density and vibrancy to Jack London Square. CIM also broke ground last week on 288 units at City Center. Oakland is definitely the boom town of Northern California right now. I swear, it’s really getting tiring scrolling through your diatribes on how “unfair” Oakland gets treated and what a great place it is. Could you possibly limit yourself to one or two posts next time when all your going to do is basically repeat yourself? I, for one, really dig the revitalization Oakland currently enjoys. It is a hard-won moment under the fragile winter sun, a project that Lionel Wilson articulated nearly forty years ago but would not live to see arrive. Yes, there are immense problems of dislocation and displacement: Revitalization and its Discontents. But given the enormity of what Oakland has already overcome in its ongoing comeback since its calamitous fall in the mid twentieth century , I have absolutely no doubt Oaklanders will find a way to cope with (!) and democratize its rising good and hard-won fortune.